Stress and fatigue symptoms from working at computer terminals can be avoided with good posture, good work habits, and adjustments to the equipment on which you work. Use these tips below and the picture to the right to adjust YOUR desk. 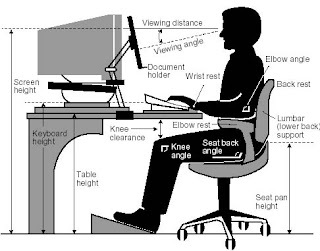 0 Response to "Desk Ergonomics: 4 Changes to Make"